Everything I needed was there except the absence of bidet at their toilet. The location worked very well for us. Right on the bus line, very near to the trams and the MRT. Not far from the working docks and park, makes a nice morning stroll. Shopping center and convenience stores very close by. Quiet, non-frenetic neighborhood. Small room, but adequate. Plenty of room in the bathroom compared to some Hong Kong hotels. Good location, easy access, near to transportation. Reasonable prices. The shower was excellent and indulging, great location, comfortable beds. Anything you could need is somewhere in the room just have to look for it. Convenient to all forms of transportation. The staff was very nice and was accommodating when we had to change plans because of circumstances beyond our control, i.e. typhoon. Would stay there again. Clean, good price, good authentic downtown location. Always smelled pleasant in the lobby and hallways. 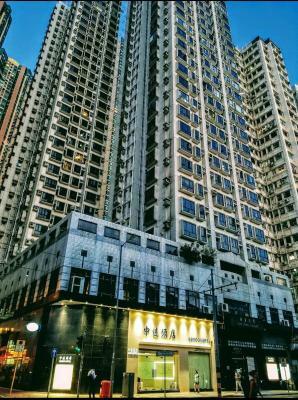 Close to MTR (subway) exit and walking distance to shops, restaurants, and the harbor. One free adapter (not transformer) for US outlet, which is really not enough, but better than nothing. Cheap hotel for HK, but not worth it for the low quality cleaning, loudness, and smell. These minor benefits not worth the major problems. I suggest you pay more and stay elsewhere. MRT right outside and a shopping mall. Far out of town, but MRT did the trick. Cosco Hotel This rating is a reflection of how the property compares to the industry standard when it comes to price, facilities and services available. It's based on a self-evaluation by the property. Use this rating to help choose your stay! Cosco Hotel is located a 5-minute walk from HKU MTR Station (C2 exit) and a 35-minute drive from Hong Kong Airport. It offers modern accommodations with free internet. Rooms at The Cosco are air conditioned and equipped with a mini-bar, a hairdryer and ironing facilities. The bathroom comes with a shower. The Pacific Restaurant serves seafood dishes and specializes in Cantonese cuisine. In-room dining is available upon request. Hotel Cosco offers laundry and dry cleaning services. Luggage storage is available at the 24-hour front desk. Cosco Hotel is located 1.2 mi from the Soho area and the Man Mo Temple. The Peak is a 20-minute drive from the hotel. When would you like to stay at Cosco Hotel? Room has a work desk, a minibar and ironing facilities. Private parking is available on site (reservation is needed) and costs HKD 18 per hour. Cosco Hotel located in Western District on Hong Kong Island. The variety transportation included tram, bus and mini bus. Most of the stops just a short distance away from the hotel. The rooms are clean and comfortable with all the necessary amenities. Local phone calls from hotel rooms are free of charge. There is Internet access available, free in the lobby and free Wi-Fi in room. House Rules Cosco Hotel takes special requests – add in the next step! Up to two older children or adults are charged HKD 200 per person per night for extra beds. Cosco Hotel accepts these cards and reserves the right to temporarily hold an amount prior to arrival. Please note that the hotel charges HKD 500 as a refundable deposit for the room key. some customers are noisy talking in hallway at times.THEY SHOULD BE TOLD be considerate,esp at nights. Room a bit small, but that's standard in Hong Kong. location - close to everything, accessible by Airport bus A10. value for money. I requested a double room and was told due to late check in (6pm??) that there were none available - I hadn't realised my request was 'optional. No apology from the reception person. Only three pillows allowed for two guests ! No box of face tissue supplied ! Only major complains was the room has no windows and the walls were so thin we could hear the next room toilet flushing and when the other guests were talking. Although it says no smoking some of the guests smoked and we could smell the cigarette smoke coming through the room door.